About 3 weeks ago I read about Millie Creperie through Toronto Life (http://www.torontolife.com/tag/millie-creperie/) and the pictures drew me in immediately. I didn't care whether it tasted good or not, because you can never go wrong with crepe and ice cream. I been waiting to go during lunch break but it is simply too far from work. At last, made a trip down to Kensington Market for crepe and taco. Millie Creperie was my main attraction, and Seven Lives was the cherry on top. Let's just say I started off the night with dessert and ended with dessert. They close at 8:30pm so I was afraid that it will be late after dinner so I decided to eat dessert first! Hehehe. Ordered the Mango Tango Crepe to share. Well, sharing was a bad idea! Everyone, please get your own. Hahaha. The handheld crepe was carefully assembled with passion and care. The sweetness of the mango gelato and whipped cream and slight sourness of the strawberry were very well balance. Every bite was delicious. The crepe was incredibly thin. For the second round, I decided to try the Green Tea Parfait. I was too busy instagramming that I forgot to take a picture with my camera. Thus, I'm using my instagram pic for reference here. The parfait comes with layers of corn flakes, whipped cream, green tea gelato, azuki bean paste, more corn flakes, whipped cream, and a full scoop of green tea gelato on top with matcha sauce, strawberries and pocky sticks for garnish. This was so good! The crunchiness of the corn flakes provided an awesome texture. Nothing was overly sweet. 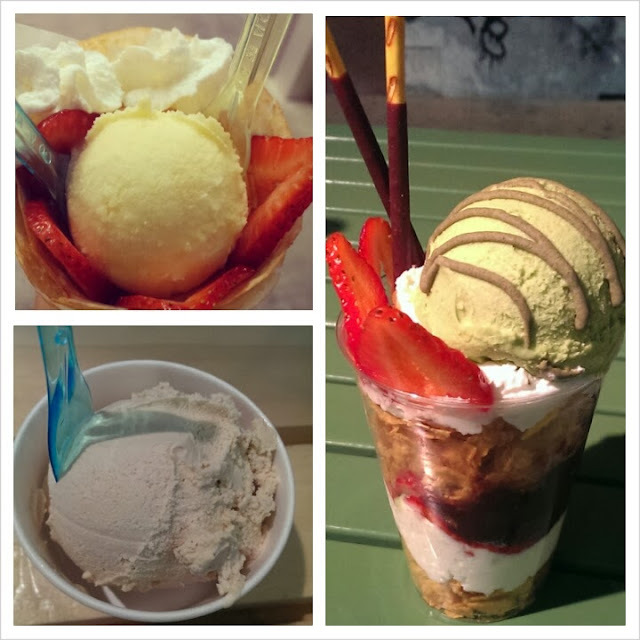 The green tea gelato was creamy with a strong green tea taste. I wish I can have this everyday! Now I have their VIP card, I will definitely be returning for more crepes and parfait. Moving on from dessert, let's talk about real food. Tacos! Seven Lives is just around the corner of Millie Creperie, this area is perfect for the complete meal. From left to right, Gobernador, Baja Fish and Blackened Mahi Mahi. I had the Blackened Mahi Mahi and I really liked it. I was traumatized by how spicy In Cod We Trust from La Carnita was so I was hesitant. All the tacos are wrapped with two 100% corn tortilla. At first I didn't understand why 2 tortilla was necessary. After I started eating, I understood why. The tacos were very saucy so it can easily seep through one tortilla. I really liked my Blackened Mahi Mahi, it was not spicy at all and the fish was well seasoned with the dry rub. I would definitely return for more tacos. Delicious warm bread with an olive oil and balsamic vinaigrette dip. I could just eat this for dinner. Honestly. I was really contemplating if we should order two pizzas or not. Since we are not big eaters, we decided on two appetizer and one pizza which was more than enough and had a slice leftover. The first appetizer is Ricotta Gnocchi Fritti (house-made crema fresca, lemon, chives, rosemary) $7. The gnocchi was perfectly browned on the outside and the inside had a chewy texture. However, I found it to be quite bland. More salt and seasoning would of enhanced the dish. The next appetizer was Buttermilk Fried Calamari (red pepper, almond romesco sauce, Libretto herb oil) $12. No complain about this dish but nothing wroth writing about either. I like the romesco sauce, provided a sweet taste to the calamari. Now finally, the star of the show, Duck Confit (bosc pear, mozzarella ) $17. This was a wonderful pizza. The sweetness of the pear and the saltiness of the duck provided a good balance. The oven thin crust was nothing to complain about. However, I did find the pizza a little heavy. Maybe I'm used to the typical tomato sauce based pizza. I was definitely not able to have more than one slice (I was already full by the time the pizza came). It was good, but it was heavy. I will return again but will order the plain and simple tomato, basil and mozzarella pizza. Then we ordered the Mango Avocado Salad and it was light and delicious. The type of mango salad I'm used to is the Thai version where the mango are still "crunchy". This salad used very ripe mangoes and avocados. The avocado and the mango paired well and I really liked it. I would try to replicate this salad at home. By the time I finished the corn, I was actually already full. Ordered 4 tacos to share amongst 2 people. Ordered the Shrimp Taco off the daily special menu. Perfectly deep fried shrimp on top of a crispy tortilla. This ended up being the favorite of the night. Next is the Beef Cheek. I had one bite and it tasted pretty decent, reminds of pull pork sandwich. The beef was well seasoned. After shrimp and beef, it's only fair to have some chicken. This is the Pollo Frito which is simply means fried chicken. The chicken was well seasoned and it was good. It's tradition to saved the best for last. Here we have In Cod We Trust which is a cod fish taco. This taco was highly recommended on all the reviews I read. But I have to say, it was a nightmare for me to eat this. NO ONE warned me that it was EXTREMELY spicy, and I mean EXTREMELY. The fish was perfectly fried but the spicy sauce killed it for me. I was not able to enjoy this what could of been the best fish taco... =( My mouth was on fire! Word of advice for those who don't eat spicy food, DO NOT order this. You will thank me. Donburi recently opened in Commerce Gate. They serve Japanese style rice bowls and their famous dish is the beef rice bowl. To start off, you get miso soup. Not a big fan of miso soup, find it a little bit too salty. Ordered Ozura Bacon (3.99) as appetizer. It was bacon wrapped quail egg. Pretty good, but nothing out of the ball park. Next is the Katsudon (9.99) which is essentially deep fried pork chop on rice. The pork chop wasn't crispy, probably wilted down on the sauce for the rice. It was okay. There was A LOT of rice underneath. Finally, the famous Donburi Gyuudon (10.99) with Osen Egg ($1). I didn't think the additional egg was necessary. The beef was really tender and thinly sliced. Again, there was WAY too much rich underneath. It was good overall. Went during the soft opening so service was a little lacking and people didn't look like they know what they were doing. I would go back if I wanted something to eat in the Markham area but not something I would go out of my way for. The Magnum Pleasure Store is a pop store serving up Magnum ice cream bar to your liking. For $6 including tax, you can pick between chocolate or vanilla bar with your choice of white, milk or dark chocolate coating. There are 21 toppings to pick from, the “pleasure maker” (that’s what they are called, it says on the back of their shirt) suggest 3 but there are no limit. You will be handed a “menu” upon entering the store explaining how the process works. You line up and a “pleasure maker” will assist you. I got vanilla bar with milk chocolate coating, topped with culinary rose pedals, chocolate rice krispies, bacon bites, and dried strawberries on top with white chocolate drizzle. YUM~ Remember to ask for “gold touch” where they will sprinkle edible gold pieces on your creation. FANCY! Hahaha For the girls, you also get a gold nail polish, Magnum Gold?! by nails inc in collaboration with Magnum. I was worried about it being overly sweet as but it was perfect! I think the saltiness of the bacon helped and I didn’t ask for any sweet toppings on top. I read that they give you complimentary water but that’s not true, it’s $1. A little further description on the toppings for those interested. The dried strawberries tasted like candy and I didn't eat that as part of the ice cream bar. The gold flakes had no taste, only for aesthetic purposes. The chocolate rice krispies provided a crispy texture and the rose pedal had a flowery fragrance and taste. The bacon wasn't overly tasty and provided a nice balance, perfect for those who like sweet and salty concoctions. The ice cream and milk chocolate coating was rich and smooth. Honestly, I would have been happy with no toppings. Hahaha~ My suggestion for topping is go easy and try not to get everything cause in the end, it probably won’t taste all that great. Simplicity. I do suggest on passing on the sea salt cause MRBF got it and it was overpowering even with just a little bit. It’s a good promotional idea to bring people in but I would only go once. Pop up store has been extended until end of August.